One of the most colourful and appreciated traditions of French rural life is now sadly almost at an end. 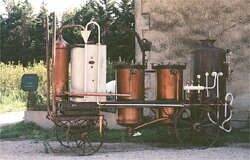 That of the Bouilleur de Cru, the mobile distiller travelling from village to village. The arrival of the still at the end of harvest season was always a big event in village life and a holiday atmosphere would ensue, with people coming from all around the district with there fruit and "must" to be distilled. The resulting spirit was referred to as Eau de Vie, "Water of Life". Since 1953 the "privilege" of being able to distil the fruits of one's labours be they apple, pear, plum, grapes etc. has been increasingly restricted under pressure from the tax authorities. C'est tres triste! My favourite is Eau de Vie, Poire Williams which is not for the faint hearted at 55% alcohol. It takes approximately 10 kilos of Williams pears to make each litre of pear brandy and about 15 days of fermentation to produce a stable "must" with 4% alcohol ready to be distilled when the Bouilleur de Cru and his mobile alembic arrives.